Join us in Chicago to connect, engage, and inspire --- Submit your research TODAY! NGS 2018 invites the submission of abstracts, either original, unpublished research or research that has been published recently in a high-impact journal. dynamics of transcription and translation, etc. forensic law, sociology research, history, etc. There is still time - Submit to ISMB 2018's Special Sessions track for emerging research areas! 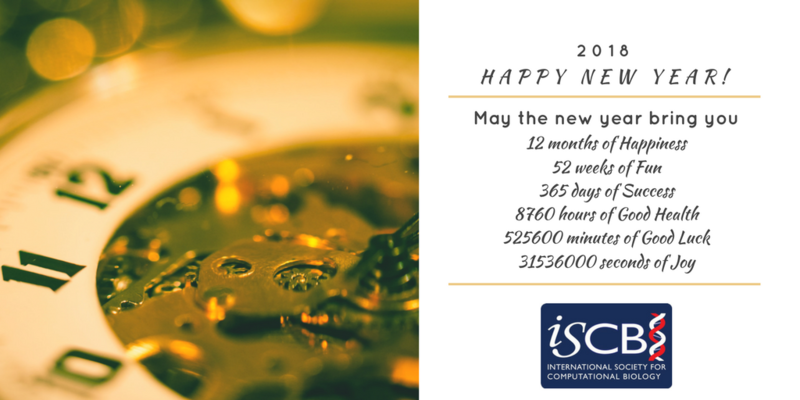 ISCB Buzz: Latest News, Events & Announcements! The Next Generation Sequencing Conference 2018 (NGS 2018) is a dedicated meeting on cutting-edge approaches to the processing and analysis of Next Generation Sequencing data. Submission of both original and previously published research are now being accepted for either oral or poster presentation. The conference has an open invitation to scientists and professionals working in the fields of bioinformatics and computational biology, specifically high-throughput sequencing, to submit high quality proposals for tutorials at NGS 2018. Deadline is February 2, 2018. 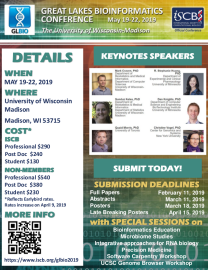 Special Sessions and Proceedings Submissions for ISMB 2018 Deadline Quickly Approaching! Submissions are encouraged to report on advances in algorithm development and optimization, data structures, data visualization, artificial intelligence/machine learning, text mining, statistical inference, database and ontology development, image analysis, citizen and open science, etc. 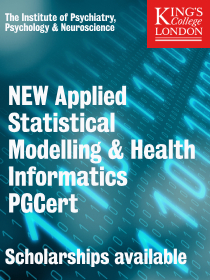 to analyze all types of biological data. Click here to learn more! ISMB 2018 also features a Special Sessions track for emerging research areas that will run throughout the conference in parallel to other tracks (except the keynote presentations). In its structure, each session(s) provides a more in-depth look at the subject matter presented. Learn more at www.iscb.org/ismb2018-submit/specialsessions. Awarding two prizes of $150,000 for transformative ideas. A rigorous and competitive global search will be undertaken to identify the most innovative projects by young scientists across a broad spectrum of scientific fields. RECOMB 2018 is the 22nd in a series of well-established scientific conferences bridging the areas of computational, mathematical, statistical and biological sciences. It has traditionally welcomed abstracts that represent a methodological advance. The conference features keynote talks by preeminent scientists in life sciences, proceeding presentations of peer-reviewed research papers in computational biology, and poster sessions on the latest research progress. We will soon be accepting both Highlight Track and Poster Presentation abstracts (see http://recomb2018.fr/key-dates/). The ECCB 2018 program committee invites proposals for one or two day workshops or special interest group meetings (SIGs), as well as tutorials. 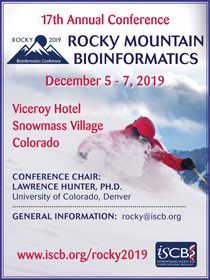 Proposals are expected to provide participants with an informal setting to discuss technical issues, exchange research ideas, and to share practical experiences on a range of focused or emerging topics in bioinformatics. Each workshop/SIG should provide an interesting perspective on the cutting edge of a selected research field. Workshops may include any form of presentation such as talks or panel discussions. 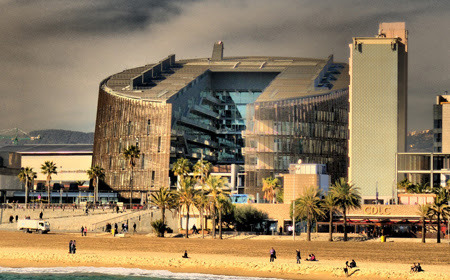 ISMB 2018 provides an intense multidisciplinary forum for disseminating the latest developments in bioinformatics/computational biology, fostering fresh dialogues and perspectives to learn about and shape the future of the field. 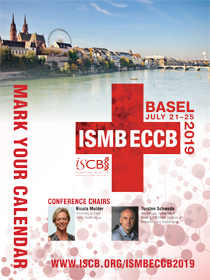 With intensified community involvement form the ISCB Communities of Special Interest (COSIs), ISMB is the leading conference in the field, with the strongest scientific and technical program that showcases the best international developments in bioinformatics and computational biology. Abstract submissions for consideration for talk or poster for the above COSIs and General Computational Biology - Novel techniques in emerging areas and intersecting field - will open February 1, 2018. Present your best methods and analysis in the open-ended competition for the CAMDA Trophy! Choose any of: The MetaSUB Forensics Challenge (urban microbiome fingerprints and mystery samples! ), the CMap Drug Safety Challenge (clinical toxicity results and gene expression responses to hundreds of drugs, opt into an FDA meta-analysis! ), the Cancer Data Integration Challenge (demonstrate robust data integration for both Breast Cancer and Neuroblastoma!). 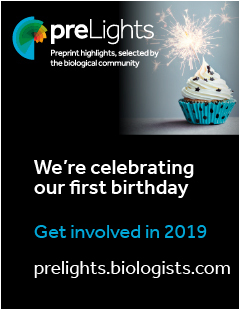 Proceedings published open access, fully indexed at Biology Direct (register intent by 05 April, abstracts 13 May, full papers 30 Sept) and Bioinformatics (submit method papers by 29 Jan). Best presentation prizes & travel fellowships. Join us 07-08 July at ISMB in Chicago, www.camda.info! ISCB's 6th annual international competition to improve the coverage on Wikipedia of any aspect of computational biology is open for submissions. A key component of the ISCB's mission to further the scientific understanding of living systems through computation is to communicate this knowledge to the public at large. Wikipedia has become an important way to communicate all types of science to the public and Wikidata plays an increasingly growing role in that. The ISCB aims to further its mission by increasing the quality of Wikipedia and Wikidata coverage of Computational biology, and by improving accessibility to this information via Wikipedia and its sister sites. The competition is open to students and trainees at any level either as individuals or as groups. Claim an article and submit by December 31, 2017! December 13, 2017 - ISMB 2018: Call for Proceedings! December 05, 2017 - NGS 2018: Call for Submissions!